The 4th (Royal Irish) Dragoon Guards was stationed at Tidworth, Wiltshire when Britain declared war on Germany on 4 August 1914. The Regiment mobilized and left Britain at Southampton on board the Winifredian on 15 August and arrived at Bolougne, France the next day. The 4th Dragoon Guards was part of the 2nd Cavalry Brigade, Cavalry Division. On the 16 September 1914, the Cavalry Division became the 1st Cavalry Division and the 4th Dragoon Guards served in this formation for the duration of the war. Corporal Edward Thomas of the Regiment had the distinction of firing the first shot of the British Expeditionary Force at German forces on 22 August and Captain Charles Beck Hornby the first officer to draw blood with a sword. The Regiment saw heavy fighting during the opening months of the war, especially during a charge at Audregnies near Mons on 24 August, and at Messines in late October and early November 1914. Following the establishment of trench warfare in 1914, there was usually little to report especially in comparison with the first months of the war. The best resource to use to find out where the Regiment was on a given day is its war diaries (see below). The Regiment did have a brief roll in the Second Battle of Ypres in May 1915 but it wasn’t until the German Spring Offensive began in March 1918 that the 4th Dragoon Guards was once again heavily engaged. When the Armistice with Germany came into effect on 11 November 1918, the Regiment was at Beloeil, 10 miles north-east of Mons close to the area where the 4th Dragoon Guards had first engaged Germans over 4 years previously. The 4th Dragoon Guards served in Germany after the war before the Regiment returned to Britain in April 1919 and was stationed at Newbridge. Officers: Have a look for a service record (I offer a copying service for these records) at the National Archives, however, if an officer served after April 1922 their record should still be held by the Ministry of Defence and you will have to apply for it. I have written an article to help you on my Second World War website: Ordering a Service Record from the MOD. Officers are frequently mentioned in the war diaries and there is a list of officers serving with the Regiment on 19 November 1917. The regimental history contains officers throughout, has a photograph of the officers serving with the Regiment in 1914, a list of officers who landed in France in August 1914, officers serving in 1916 and an appendix with brief biographical notes. For information regarding an officer’s promotions, look at my articles on the London Gazette and Hart’s Army List. 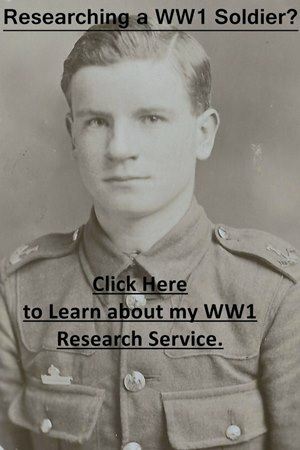 Also, have a look at my page on Researching Soldiers Using Newspapers. Captain Archibald Wright 4th (Royal Irish) Dragoon Guards whose portrait appeared in The Sphere after he was wounded. Archibald was wounded twice during the war on 31 October 1914 and 25 May 1915. The Sphere contains thousands of portraits of officers who became casualties during the war and can be searched on FindmyPast. Other ranks: Search for a service record but be aware that many were destroyed in the Blitz. If a soldier continued to serve in the British Army past January 1921 then you will have to order his service record from the Ministry of Defence and this link will take you to my Second World War website: Ordering a Service Record from the MOD. Even without a service record, you will usually be able to uncover information, especially from medal records. If you know a soldier’s regimental number then you can often work an approximate enlistment date. Newspapers are fantastic resources especially if you’re looking for casualties or a photograph of a soldier. In the Regiment’s last war diary, there are lists of casualties sustained by the 4th Dragoon Guards during the Spring Offensive in March 1918 and on 22 August 1918. You will need to use both Ancestry and FindmyPast to research a soldier who served in the First World War as they have different sets of military records. Fortunately, both offer free trials and clicking on the banner below will take you to FindmyPast. 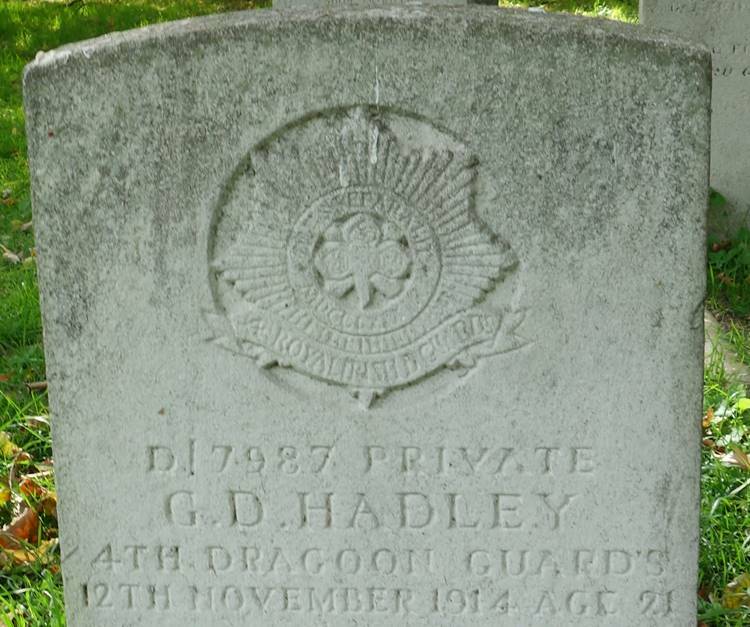 Below is the headstone to Private Geoffrey Donyan Hadley 4th Dragoon Guards who died of wounds on 12 November 1914 and was buried in Brompton Cemetery, London. Unfortunately, no service record has survived for Geoffrey as it was destroyed in the Blitz. Geoffrey’s Medal Index Card recorded that he landed in France on 16 August 1914 and the Regiment’s first war diary is an important source of information for researching his service. The war diaries for the 4th Dragoon Guards are very good and all have been digitized by the National Archives and are available to download for a small fee. To download the war diaries click on the blue links below. Notes: A good war diary with many detailed entries, though not as detailed for 1914 as they would later become. Unfortunately, there are no appendices. Notes: Another good war diary with detailed entries. Notes: A good war diary with some very detailed entries which has been digitized and is available to download from the National Archives’ website. The list of casualties sustained by the dismounted company can be found in the 4th Dragoon Guards war diary listed above. Notes: A very good war diary with lots of detailed entries. There is a list of officers serving with the 4th Dragoon Guards in June and September 1916. Notes: A good war diary. Notes: Another detailed war diary though entries after October 1918 are a lot briefer. There is a list of officers serving with the regiment on 19 November 1917 and a list of casualties sustained by the 4th Dragoon Guards during the Spring Offensive in March 1918 and on 22 August 1918. There is a short regimental history: Record of the 4th Royal Irish Dragoon Guards in the Great War, 1914-1918 by the Rev. 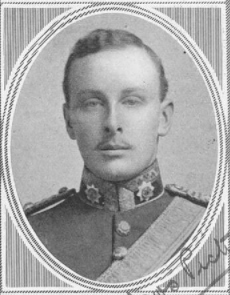 Harold Gibb, Lieut., 4th R.I. Dragoon Guards, 1914-1915. The book contains a 60-page narrative of the 4th Dragoon Guards’ service during the war and a variety of appendices. An important book for researching those who served with the 4th Dragoon Guards as it contains a list of officers who landed in August 1914, short biographical notes on officers and a casualty list of all those who died. This book has been reprinted by the Naval and Military Press and you can buy a copy from Amazon. Private Papers of Lieutenant George Ralph Miles who was attached to the 5th Dragoon Guards: Documents.14328. Private Papers of Captain G Dent who served with the Regiment abroad between May 1915 and January 1916. This collection is on microfilm: Documents.12047. Private Papers of Private W Nicholson which contain 115 letters and other documents. Nicholson served on the Western Front with the Regiment between November 1914 and August 1916 when he was killed: Documents.8401. Private Papers of Colonel Guy Eliot de Pass which is a 7-page account of his service with the Regiment in 1917-1918: Documents.7605. 1 February 1916: Vermelles: Nearly the whole Battalion was employed on various fatigues in and about the trenches near Vermelles. This was especially hard on the 4th Dragoon Guards Company who had to march the whole way from Sailly to Vermelles, quite two and a half miles. Fine weather and very little gunfire from enemy. 2 February 1916: Sailly: The 1st Dismounted Brigade went into Divisional Reserve and the 18th Hussars and 9th Lancers companies and Battalion Headquarters marched back to Sailly. The 4th Dragoon Guards Company kept their same billets and so did not have the fatigue of a march after the previous hard work. 3/4 of the company had baths at La Bourse. 3 February 1916: Brigadier-General Kirby Commanding 1st Dismounted Brigade inspected the billets of the 2nd Battalion. Those of the 4th Dragoon Guards Company were very good and clean. The other companies were also not so fortunate in the billets they took over. Battalion had baths at La Bourse. 4 February 1916: 2/Lieut. Herron arrived from billets as Battalion bomb officer. Bombs were drawn from Brigade Bomb Store in Sailly and Company Bombers had some good practice. Major-General Mullens inspected the Battalion Billets. Great precautions taken to ensure that they are handed over improved and clean to the infantry. 5 February 1916: Not more than two officers from the Battalion allowed in Bethune at a time, as we are ready to move at an hours notice. General Kirby again inspected billets. Colonel Sewell and 2/Lieut. Herron inspected the portion of line the Brigade takes over on the 8th instant. 6 February 1916: Divine service for the Battalion in Sailly Cinema Hall. 11 am Colonel Sewell and Lieutenant Chance went round D.1. Sector and visited the Officer Commanding 6th Battalion 3rd Division Mounted Brigade which we shall relieve on the 8th. Quite a good bit of line with 4 or 5 saps in D.1.b. Line of relief and position of guides were arranged with Colonel ?. Captain ? and other Company Commanders with their respective Bomb Officers went round their own particular sections of line. 7 February 1916: At 7 am a practice gas alarm was carried out with a view to finding out how soon the whole Battalion could be on parade with helmets properly adjusted after the alarm was wounded. It turned out that this took much longer than one had expected about half an hour. Men were completed with a second pair of socks each and anti-frostbite grease. Company transport came up from Verquigneul by the afternoon. One limber per company for bombers and two more per Company for rations and stores. 24 hours rations on the man and 24 more to be dumped at Vermelles and carried into the trenches.